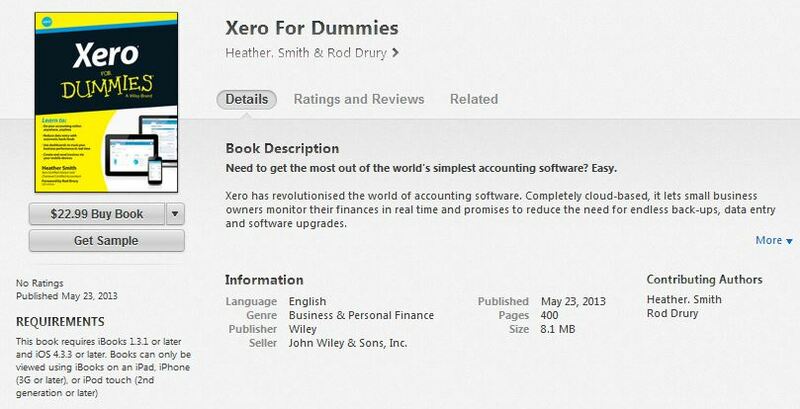 I’ve written Xero for Dummies, a comprehensive guide to using the fabulous online accounting system Xero. I’ve written this book, like I’m sitting with you working you through every question you may have about Xero. You can buy Xero for Dummies from all good book stores – you should find it one the book shelves with all the other yellow and black books. I guess it all depends on how you learn; If your the type of person who likes to read and work through detailed precise steps, then you’ll love this book, and hopefully it will find a nice place on your business book shelf for it. An elderly client surprised me the other day – she had already bought the e-book and told me she much prefers to have books on her iPad so she can take them with her where-ever she is. She made me feel like such a Luddite – I would never have thought of that – but buy it in what ever format works for you! I’ve been a writer since I could put pen to paper, and I love to write about everything small business. I’ve written Learn MYOB in 7 Days (yep I’m a MYOB Certified Consultant), and I have written Learn Small Business Start-Up in 7 Days (a brilliant book which I’m really proud of!). Then on 30th May I was contacted by Rod Drury CEO and co-founder of Xero. I took a proposal to my publishers and here we are a year later, with a yellow, black and CYAN Dummies guide to Xero. Google tells me that a WHALE has a gestation period of around 365 days which is about how long it took from Rod contacting me to the arrival of the physical book…in fact it took about 4 months for me to write…but there are a lot of hoops to jump through to get a book approved, edited, published and distributed. In fact Mamma WHALE has produced quadruplets!! There are another 3 Xero for Dummies titles soon to be launched. Exciting huh? I’ve also been asked if I work for Xero. No, I don’t work for Xero. I am an independent Xero Certified Advisor. I think it is important for everyone involved, especially you the user, that I was totally independent. I hope you agree….However saying that, Xero have been incredibly supportive and have technically checked every corner of the book! If you would like to hear more about the writing process you can listen to this interview I did with Tim Reid on theSmall Business Big Marketing podcast and Pete Williams on the Preneurcast show. I hope you find them entertaining interviews. I have received some lovely feedback about them. Many thanks to Xero who have kindly endorsed the book. Xero staff around the world have answered queries into the wee hours of the morning, and the elite Xero training team have technically checked the book. So thanks to the extraordinary staff and partners of Xero — from Sue Pak, Tim Wright, Gayle Abou Maroun, Colleen Diver, my magnanimous account manager Jason Forbes, the ORANGILICIOUS Catherine, and Xero consultants Cassandra Scott, Melanie Morris, Gillian Rossouw, to everyone else in-between, and especially those who provided the technical check of the material and responded to my pesky night-time queries! Thanks to Rick Van Dyk and Matthew Addison and the team at the ICB Australia. Thanks to my writing mentor and friend Valerie Khoo and her Australian Writers’ Centre community — in particular, Bill Harper and Alistair McKillop, who challenge and believe in my writing. The RRP of this book is $39.95, the additional charge is to cover postage. Thinking about starting a business? Then Learn Small Business Start-Up in 7 Days is the book for you. It is a comprehensive DIY program to work with you to develop a business plan. It explains concepts then asks you to complete questions based on your business, then tells you where to slot the answers in the business template. Learn Small Business Start-Up in 7 Days Guides you through key aspects of getting a new business up and running, from a self assessment about whether you are really prepared, through to finance, marketing, and legal issues, highly sought-after small business commentator Heather Smith covers it all. The practical guide to learning the essentials of starting your own business in just one week. Learn Small Business Start-up in 7 Days carefully explains everything you need to know to efficiently and effectively start a business, the book comprehensively covers the basics in 7 chapters, one for every day it will take you to get ready to leave the rat race and live your small business dream. While running a small business allows you to turn your passion into your livelihood, it is also often very demanding on your time, your cash reserves, and your sanity. With this book in hand, you have everything you need to lay a solid foundation for small business success. Day 1: Are you ready to start a business? This is a recording with Pete Williams of PreneurCast about the Learn Small Business Start-Up in 7 Days. Hope you find it interesting. Valerie Khoo — Small business adviser, Enterprise columnist for five daily newspapers and author of Power Stories: The 8 Stories You MUST Tell to Build an Epic Business. Andrew – the next start-up to watch!! This book arms you with the knowledge you need to navigate your way through MYOB Accounting software and frees up your time to focus on your business. Hi, Heather Smith here! I have been empowering and training people how to use MYOB AccountRight software for many years. Learn MYOB in 7 Days (RRP $29.95) shares with you what I know about setting up and using MYOB AccountRight software. It is like having an experienced consultant with you at your side, working you through every stage you need to know. I love numbers. It is critical for business success that you have an appreciation of your business finances. Though numbers bookkeeping and accounting can be overwhelming. This book is not a tiresome text, it is chatty. It includes stories and analogies, and it is based on small business reality. Learn MYOB in 7 Days (RRP $29.95) is your step-by-step guide to taking the stress out of keeping your books with MYOB! This small business guide covers all the essentials, from setting up an account through to confidently producing financial reports, and all that’s in between. In seven quick and easy steps, this book arms you with the knowledge you need to navigate your way through MYOB and will free up your time to focus on your business. Packed full of tips, tricks and traps to avoid, this is essential reading for small business owners and bookkeepers wanting to quickly and easily learn MYOB. This book was published in March 2012. There have been updates and changes to MYOB since its release. You will still learn the essentials of how MYOB works with this book, but sometimes a button will be a different colour or in a different spot. I still train classes using this book on a regular basis – and we have minimal issues with the changes.